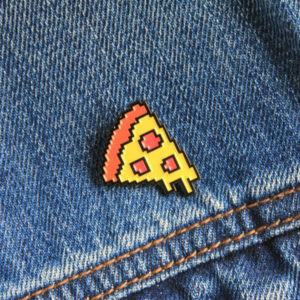 Over the last few years, we’ve posted some really fun and amazing food enamel pins. This week we’ve selected some of our favorites to showcase. If you’ve got any to add to the collection be sure to reach out or post using our add a pin section! Below are a few links to some of the most popular food tags on the site. We were recently asked by a friend why no love for Deadpool? As usual we don’t really have a good excuse and with DP2 hitting theaters Wednesday this week we might as well make this a Marvel month for enamel pins. This deal should get you all excited for your first day of superhero school. 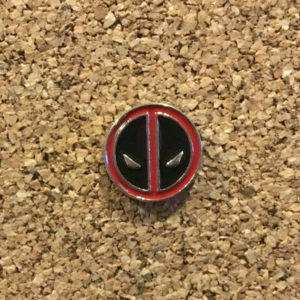 The Marvel Deadpool enamel pin is super small at just .69″ almost making it into the “Tiny Pins” tag but falling short. 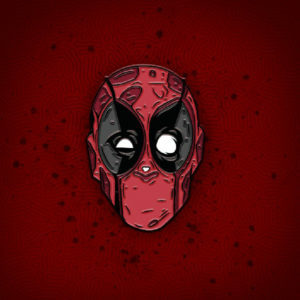 This Deadpool logo lapel pin is a soft enamel with silver plating. It comes single posted and just two color enamel fills. You can pick this one up for a quick $5.00. Perfect for any Deadpool fan. Header over to Puddle Bunny’s Etsy store for plenty of other pins and be sure to remember: with great power comes great merchandising opportunity. 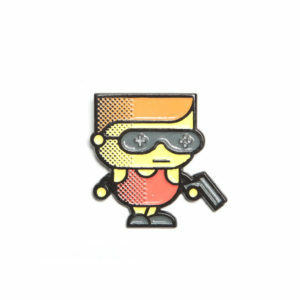 One of our favorite characters from Teenage Mutant Ninja Turtles is now in pin form! Say hello to Slash! 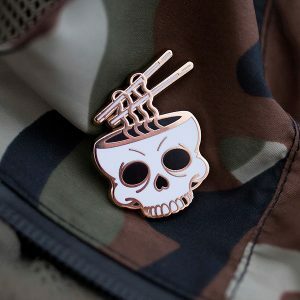 This collaboration between Warrior Pins and Never Die Clothing has everything you’d want and expect in such a great pin. 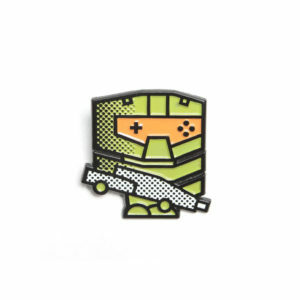 Slash is a 1.75″ hard enamel pin with silver plating. Since this is a larger than average pin, it’s got 2 posts to help keep it in place. Slash has around 6 different color fills and has tons of details to go with it. We love the art direction and use of silver and hard plating to make Slash come to life. If you’re a fan of the comic or cartoon, you’ll definitely want to check this one out. Slash can be purchased currently for just $10.00. 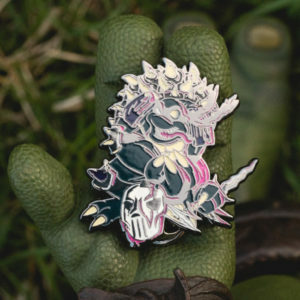 Be sure to check out the Warrior Pins shop for tons of other great TMNT enamel pins! Mother’s Day is just around the corner and it’s the perfect topic for this weeks pin blog. We think the best way to say thanks is with one of these lovely flower enamel pins from Oh, Hello Stationery Co. What mom doesn’t appreciate flowers or like pretty things? The price is right and it’s our deal of the week. 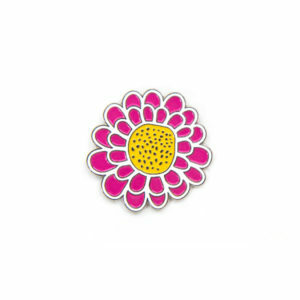 This Flower Power enamel pin is a larger, 1.5″ soft enamel pin and comes single posted. It’s gold plated and features three color enamel fills: pink, yellow and white. It’s the perfect gift to show your appreciation and there is still plenty of time to receive it before Sunday the 13th is here. And, at just $6.95, you’ll be glad to you didn’t miss this one. 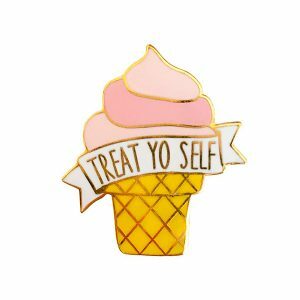 As always, be sure to check out Oh, Hello Stationery Co’s Etsy shop for tons of other great enamel pins. Avengers Infinity War releases in just a few days and we just can’t get excited for a movie if there is not the perfect pin to go with it! While most of these Avenger pins are hard to find or sold out in a lot of places we were able to find some stock through seller “Hobby Hunters”. 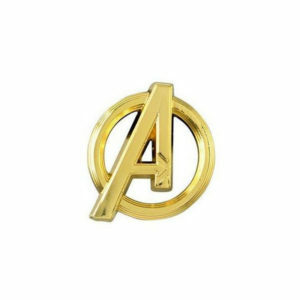 The Marvel Avengers Logo pin is exactly what you would expect and want from a logo pin. Simple, die struck and with a nice gold finish. This particular pin is made from pewter and is officially Marvel Infinity War branded merchandise. 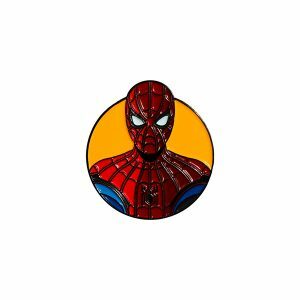 Currently priced at $9.95 this Marvel lapel pin would make a fantastic addition to any comic or movie collection. If you enjoy or collect travel pins than you won’t want to miss this deal of the week. 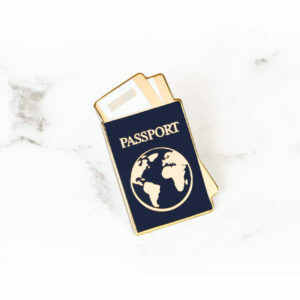 We came across this great passport enamel pin and knew it would be a perfect fit for all the world travelers out there. This passport enamel pin is a 1.2″ tall hard enamel pin with gold plating. It features a navy and white enamel fill and comes single posted. These are second grade pins so they may have some imperfections (you can check the link for more details). You can pick one up for just $4.75. Now all you’re missing is your boarding pass. Be sure to check out LENSES and LOCALS Etsy shop for some other stunning photography and travel enamel pins designed in Australia. Now that it’s finally getting warmer over here in the mid-west we’re starting to see the cyclists back on the roads. 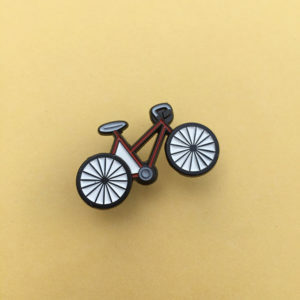 That got us thinking about bicycle enamel pins and what there is out there. Guess what? We didn’t have a single one listed! That’s got to change so we’re starting by featuring this fancy pin from Felt Good Co. to share some love (and some road) to all the cyclists out there. The Cool Bike Enamel Pin has everything you’d want in a pin. Soft enamel and 1.5″ in size. It comes equipped with dual silver metal clutches and features a black dyed plating with a red enamel frame, gray seats, gray handlebars and gears. To top it all off, the wheels even spin. What more could one ask for in a lapel pin that all this? Cool bike could be the first biking pin in your collection for a reasonable $10.00 and is available from Felt Good Co’s online shop. 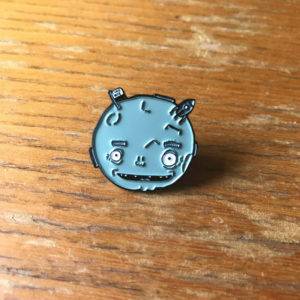 Be sure to visit Felt Good Co’s shop for some other splendid pins. If you like bikes, be sure to also check out their Cool Bike w/Doggo Enamel Pin. Sometimes, we’re just a sucker for a unique and random doodle style pin. We love running across something different and when there’s a deal, we’re on the case! This week’s deal lapel pin is called “Moon” from “Doodles from my Brain”. If that sounds familiar, that’s because we’ve featured a this store once before. Their pickle doodle enamel pin we posted about back in September 2017 so we were pleased when we found moon with some seconds available. Moon is a .86″ soft enamel pin with a single enamel fill and black plating. These seconds come single posted and are currently on sale for just $4.43. 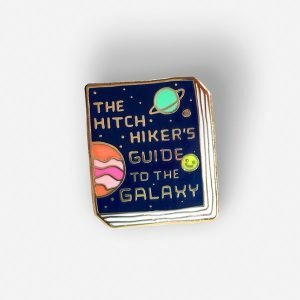 These the perfect pin on the cheap for a collector (especially if you enjoy doodles, art or space!). You’ll love all the little details in this one and we think it’s a great one to add to the ever growing collection. Be sure to take a minute and visit Doodles from my Brain’s Etsy shop. This week we’re going from sea to land while we are on the hunt for the most clever food and animal mashup pins. We hit the jackpot when we found this cat themed focused pin shop. 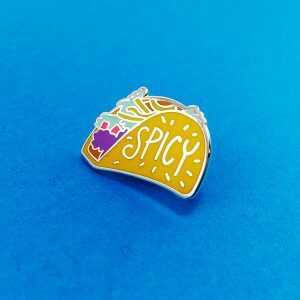 Not only does JustDuet steal the show with their Orange Cat lapel pin, they also have a plethora of other cat and food mashup pins that made it difficult to pick our favorite to feature. 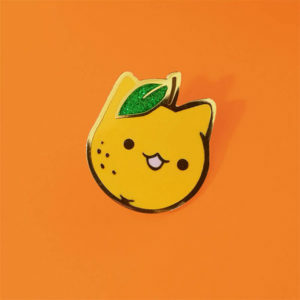 Orange Cat enamel pin is hard enamel, gold plated pin. It comes at around 1.2″ tall and has a single, rubber clutch. We particularly love this pins simplistic design. We enjoy all the little, well thought out details in this one like: the stem, the green glitter enamel leaf (that gives it a great 3d effect), and little plated dimples. The price is a very reasonable $10.34 USD after converting from euros. Check out JustDuet’s Etsy Shop for tons (15+) of other cat and food themed enamel pins (Don’t miss grilled cheese cat and pizza cat). Be warned, you may not make away from their store one without adding a few pins to your collection! This week we’re being inspired by our favorite foods and animals in a mashup themed week (our first)! 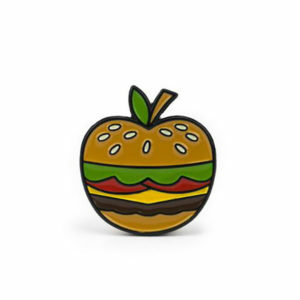 We’re not exactly sure why we’ve never thought of this before… We just got to talking about favorite food enamel pins with animals and there it was, pins of this mashup galore! We then stumbled upon this awesome deal. 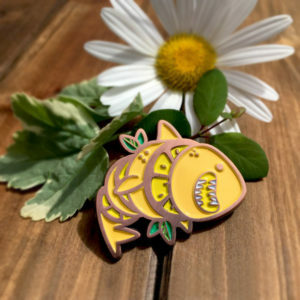 Not only is the Lemon Shark enamel pin an adorable mashup of fruit and predator but it also comes in a few variations for those who have particular tastes. A hard and soft enamel variant are both available. Both come with an antique copper metal plating and both are the same size at 1.25″. The coloring varies a little between these two but each has their own uniqueness to them so you may find it hard to choose. With this being our deal of the week post, we’ve got to bring attention to the “Bruised Lemons”, which is the funny way to say “Seconds” for this pin which are just $5.00 marked down pins that have some scuffs from the antiquing process. Be sure to visit Berntkat’s Etsy Shop to browse a few other pin offerings and be sure to keep an eye out for more awesome food and animal mashup pins being added this week! This weeks featured pinfunding campaign continues our astro and space themed week with a bang! 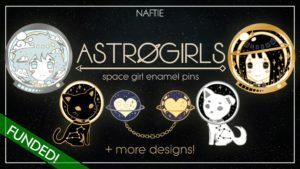 Astrogirls – Space Enamel Pin Series by naftie is a series of pins featuring the Astrogirls and designs relating to their time in space, including cute cats, dogs, and pastel girls. This is an already funded campaign but there is still plenty of time to select a pin from the set for just $11.00. Pins from this set will be available in the online store after the campaign but if you get in early via Kickstarter, you’ll be able to score a discount. We’re continuing our cosmos inspired theme this week and today we’re going rocket powered. I mean, if space really is the final frontier then we’re going to need mass amounts of rocket propellant and reaction engine’s to get us going in the right direction (up!). 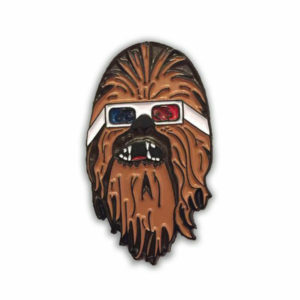 With this weeks featured pin you’ll be showing your love for space travel and rocking out in style. 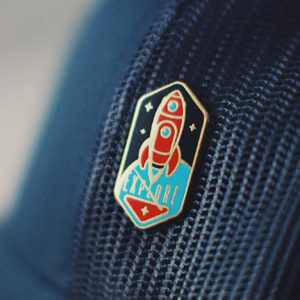 Space Explorers is a 1.25″ tall, hard enamel pin. This one features a gold plating with three color enamel fills and is a limited run of just 100, so it won’t be around forever. With such a mass amount of space pin options to choose from, this one may just take the cake. The unique shape, lettering, planet, and starry sky for this pin makes it yet another one that is too good to simply pass up. Space Explorers enamel pin is now available from Fugstrator’s shop for just $10.00. This week we’re heading to the cosmos for some inspiration! We’re not celebrating anything specific, it’s really just any easy excuse due to our enjoyment for finding all the best space enamel pins out there on the web. This weeks deal fits right in. It has all the internet’s favorite things mashed into one: cats, space and skeletons. How can you go wrong? 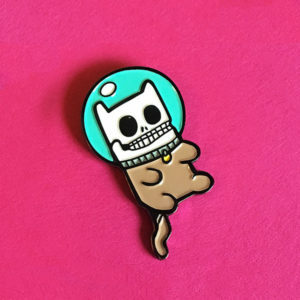 Cosmic Cat Corpse soft enamel pin is a 1.1″ tall pin that has a black dyed plating and comes with a single post on the back. This is a limited edition run of just 100. We really enjoy the comical value along with the mashup choices and love it when a pin gets a laugh. All this and it’s currently on sale for just $5.30. Be sure to add this one to your space, animal, cat or pin collection before it’s gone! This weeks deal comes from seller Fizzy Bat. 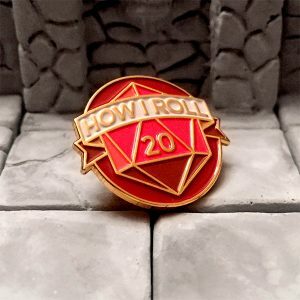 You’ll want to be sure and take a few extra minutes to stop by their Etsy shop to browse some of their other great pin offerings! 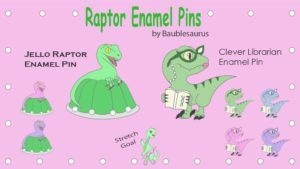 Four our first Pinfunding feature, we are sharing this Raptor Enamel pin campaign, a dinosaur themed campaign from Baublesaurus! At the time of this post, there are only 9 days left for this Kickstarter to reach its reasonable goal of $800.00. There are still spots left to pledge $11.00 to get an unlocked pin of your choice if the funding succeeds. 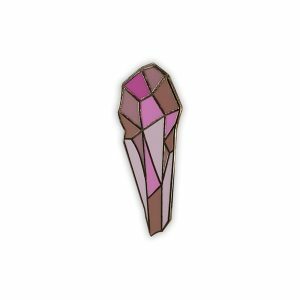 There are currently two unlocked pins available, the Jello Raptor (Our favorite!) and Clever Librarian. Each will be produced with the details below. To read more details and view the campaigns stretch goals, visit the Raptor Enamel Pin Kickstarter page. 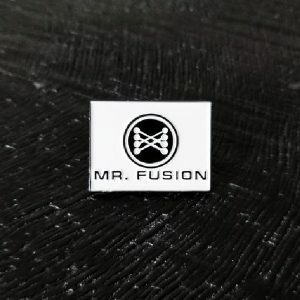 Also, take a moment to visit Baublesaurus website where you can brows tons of other great lapel pins ready for purchase. We’re gearing up for Ready Player One and instead of focusing on a single featured pin this week, we’re taking a bit of a different approach. We’ve hand picked nine of our favorite pins featuring films, franchises and topics mentioned from the Ready Player One science fiction novel. These lapel pins are of various sizes and genres but today they all have one thing in common. Be sure to take a few minutes to take a closer look at some of the amazing art featured below. Visit these great sellers, artists and consider making a purchase to show your support! Last week we stopped to celebrate our joy for pirates with the launch of Sea of Thieves and this week we have selected some gaming pins that will go great with the release of Ready Player One this Thursday. We were lucky enough to catch this sale going over at Fan Fit Gaming’s Etsy shop. Currently, their enamel pins are all on sale with most of them marked down 50%. We’re focusing on their gaming pop art collection specifically which are all currently going for just $4.99 or $35.00 for the set of nine. Each of these are about 1.5″ in length and are all black plated soft enamel pins. It’s the perfect time to pick up a few or the whole set so don’t wait on these! Be sure to visit Fan Fit Gaming’s Etsy shop to see these deals and other discounted pins! We’re still celebrating the Sea of Thieves launch this week with a focus on pirate themed lapel pins! For todays feature, we found the perfect matchup of all the things we love. 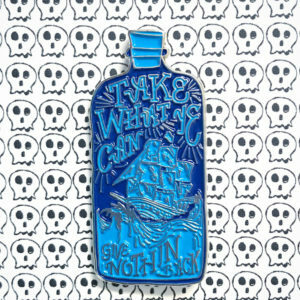 This one falls not only into the pirate pin category but also into one of our other favorites: “in a bottle enamel pins“. Rum Bottle Pirates soft enamel pin is a silver plated pin from Magical Monograms. It’s also a bit taller at 1.5″ and comes with dual posts. It features some great lettering work with the pirate saying “Take what ye can, give nothing back“. This bottle pin has some simple coloring with a light and dark blue enamel and in an strange way, we think it all works together to create a unique pin. For us, it makes this one an easy decision at just $10.00. Don’t forget to visit Magical Monograms Etsy shop for some other great pins! And, if you happened to miss our pirate pick from Monday, take a look at the Skull and Crossbones deal of the week. We’re back with another Deal of the Week! This week we’re focusing on one of our favorite themes, pirates! We’re celebrating the launch for Sea of Thieves from Rare which unlocks in our region in just a few hours! 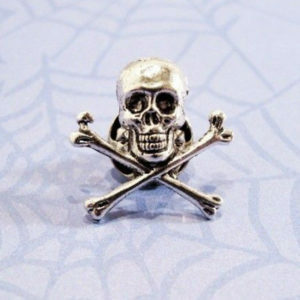 The Skull and Crossbones die cast pin is the perfect choice for any seaworthy captain. This silver coated brass pin comes as a smaller .82″ and is single posted. We love the joker style smirk and the skull and crossbones make a perfect match for a die cast. It’s also a deal at just $5.95 Canadian dollars ($4.55 USD) from Pinz’n’Thingz shop. Keep a watch this week for more pirate themed pins and maybe we’ll see you on all the treasure hunts ahead! We’ve launched a new feature to the site called Pinfunding! Crowdfunding for enamel pins has been our most requested topic and up until now, we’ve not had anything in place to do so and that’s changing! The Pinfunding page will keep track of what new enamel pins are upcoming from all the crowdfunding platforms and artists out there. We’ve already added several to this section and more are in the works. We’re planning on reserving Friday’s for blog posts about Pinfunding so soon you’ll be seeing new content coming through. To start things off, we’re bringing some attention to our first featured campaign called Ecospheres by Crystal Curtis. This campaign is bringing 4 fantastic nature and fantasy themed enamel pin scenes to life. Each pin will be 1.25″ and single posted. At the time of this post, this campaign has already been funded but there is still plenty of time to get in on the initial round with 17 days remaining. $12.00 will get you a single pin of your choice while $40.00 will net you the full set. Currently, this backed project is planned to deliver by July 2018. 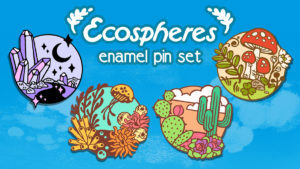 Visit the Ecosphere’s Kickstarter Page to learn more and back this set! A wizard is never late, nor is he early, but he will always arrive wearing a large, pointy hat. Does anyone know why wizards wear hats anyway? All these wizard thoughts are swimming around because we found what we think might be the best wizard of them all; the Goldfish Wizard. 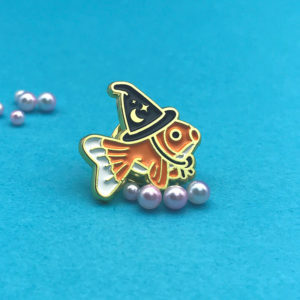 This adorable Goldfish Wizard enamel pin from seller John Moniker puts the “aww” in awesome. We love the overall design of this pin and the stars and moon in the hat add the perfect touch. The goldfish wizard pin is on the smaller size at .75″ wide and tall. It comes as a soft enamel with gold plating, three color fills and is single posted due to the small size. If you love fish, wizards, fantasy or just great mashups than this one is for you. 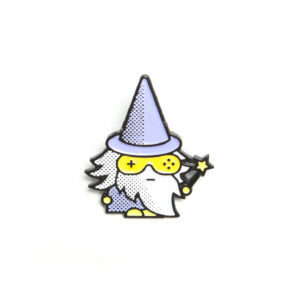 This fishy wizard can be yours for just $8.50. 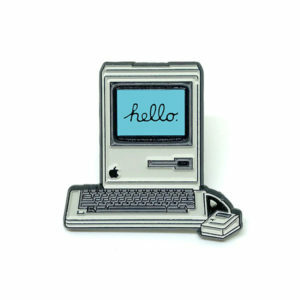 Be sure to stop by and visit John Moniker’s Etsy shop for several other great lapel pins. Also, be sure to pay extra attention to the blog this week as we’ve got an extra post in the works with some exciting news! We won’t be seeing any new Star Trek Discovery episodes until next year. That means we can go back to falling asleep to the sound of captain Picard or James T. Kirk courtesy of the old Netflix. If you’re looking to up your Trek pin game than we’ve got a deal for you this week that may be too good to pass up. The Star Trek Insignia enamel pin is a small, .78″ pin. It has a silver plating and comes with a single post due to the smaller size. Just a simple, white and black enamel fill in the shape you have seen a million times and love. 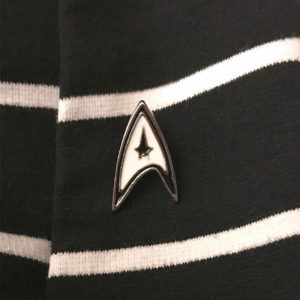 This small pin currently goes for just $4.30 and is the perfect adornment for any Trekkie. 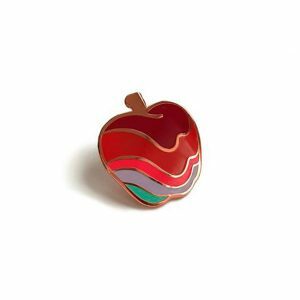 We especially love that this pin will suit any attire due to the size and coloring. You can pick up this pin today from Nerdasm’s Etsy Shop. Upon further inspection we’ve noticed we’re really lacking in our Star Trek pins tag. If you’ve got some ideas to help fill out this section of the website, please send some suggestions through our contact page and we’ll handle the rest. 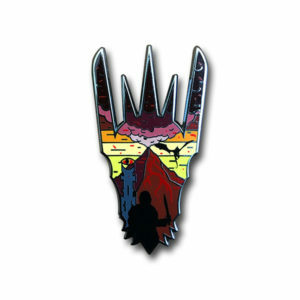 If you’re a store selling an awesome Trek pin, let us know and we’ll post a free ad for you if you mention this post. Can’t beat that! Ready Player One is out on March 29th and we’re excited to watch Ernest Cline’s novel hit the big screen. 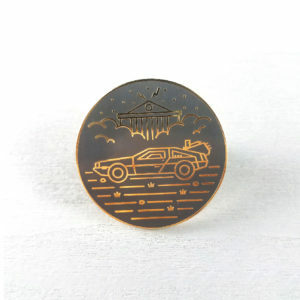 That got us thinking about Back to the Future enamel pins and we found these perfect DeLorean pins still available from Meugraphics. The Back In Time DeLorean enamel pin is a 1.25″ hard enamel pin. 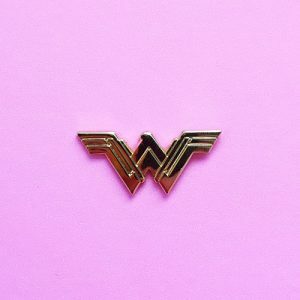 These circle pins all come as a gold enamel plating with a unique background design for each variant and go for $10.00 each or set of 3 for $25.00. Be sure to act fast and visit Meugraphics shop to grab one or a set of these while you can!